A hard drive can get to the point it won’t boot a computer, but contains critical data. Additionally, there are times when one needs to have a large number of files available in portable form, and having them all on an internal hard drive, as in a laptop, is not feasible. There may be other occasions, too, where a temporary storage solution is needed. I have recently been in a position to need solutions to all of the above. When those needs arise, nothing works so well as having a way to connect a bare hard drive to a computer. Fortunately, there are devices, both manufactured and improvised for that purpose. Because I do quite a bit of computer work including moving data from one computer, I have a number of such devices. 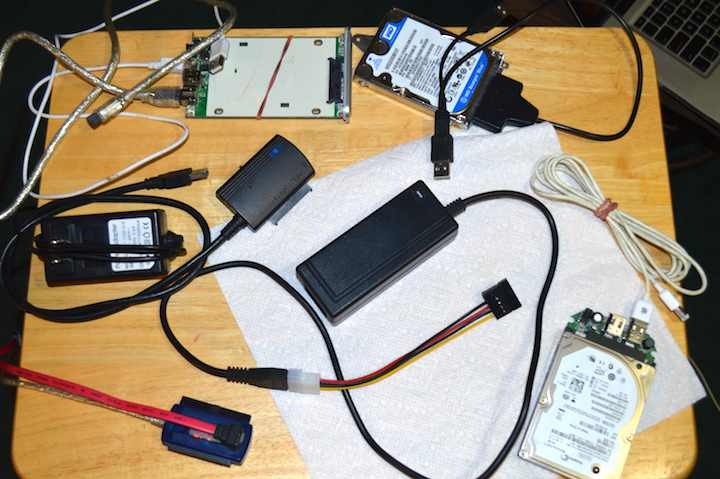 I have at my disposal, a FireWire 400 sled for IDE/ATA, 2.5 inch drives, a Firewire 400/800, USB 2.0 sled, a USB 2.0 cable with an IDE/ATA and eSATA interface that will allow connection to 2.5 inch or 3.5 inch hard drives, a USB 2.0 portable dock for 2.5 inch SATA drives, a USB 3.0 portable dock for SATA that will handle 2.5 inch or 3.5 inch hard drives. With each of the USB devices, there is an external power source required to power up a 3.5 inch drive. Until recently, I had a FireWire 400 sled for 3.5 inch hard drives. It finally gave up the ghost, and I have yet to obtain another. So far, the USB portable docks have worked just fine in its place. What a USB connection won’t do, however, is boot a PowerPC. That limitation does not exist for Intel Macs or PCs. I recently added a USB 3.0 to eSATA device to my stable of interfaces, and it works great. I have yet to include Thunderbolt for my own use, but did acquire one for a church in California. A portable dock system that worked very well! Simply slide a 2.5 inch hard drive into it and plug it into the Thunderbolt port on the computer. As with Firewire and USB, no other power supply is needed for a laptop drive. Very recently, one of the grand daughters was given a brand new, second hand laptop, in the form of a 2009, white, unibody MacBook. She wanted it to have a new operating system installed, (OS X 10.7, aka Lion) and have all her settings and data moved from her previous laptop, a 12 inch, 1.2 GHZ iBook running Leopard. The dilemma? Connecting the iBook to the MacBook, directly, to migrate data and settings at the point in OS installation, where that possibility is provided. The iBook can be booted into Target mode for that purpose, but as there is no FireWire port on the 2009 or 2010 MacBook, that does no good at all. What to do? Well, there is the home network, but from hard won experience, I can say that option is very slow. Using an Ethernet connection is also slow. Been there, done that, and it’s painful! I have, on occasion, simply removed the hard drive from the old Mac or PC, connected it via one of my external interfaces, and proceeded to have data moved that way. However, getting the hard drive out of an iBook is no simple task. It requires much disassembly, as in removal of the bottom case to get to the screws holding the top case on, then removing the top case to access the hard drive. Work to be avoided if possible. In this case, I used a SATA Firewire “sled” connected to the iBook, cloned the internal hard drive through the Firewire interface to a bare hard drive I had available. Then I moved the bare hard drive to a USB to SATA, portable dock, connected it to the unibody MacBook and proceeded to have the contents of the clone migrated to the MacBook, selecting the option “From a volume connected to this Mac,” during the installation process. This worked very well, and everything moved over smoothly. Of course, there were applications that worked on a PowerPC running Leopard that didn’t work in Lion. Those were deleted and their more up to date versions, where available, were installed in their place. When the need arises to capture data off of a dying PC hard drive to put back onto a new one, I have found that removing the failing drive from the PC, and connecting it via USB or FireWire to my MacBook Pro allows me to copy the data off of it so it can be copied to another available drive for eventual recopy to the new PC or new PC hard drive. Yes indeed, an Intel Mac can read a PC formatted hard drive without a murmur. The portable docks make it a lead pipe cinch! As for expense. The USB, portable docks are very inexpensive, even for the USB 3.0 dock. I don’t have $50 invested in all of them. Buying the FireWire hard drive cases was not cheap, but when they are needed, they have proved to be a wise investment. They are very portable and take minimal room in my laptop bag. Like a pocket on my shirt, I don’t know what I’d do without them!